The Liberal Bee Jays continued their winning ways with a 6-0 shutout victory in El Dorado to sweep the three game series. The Bee Jays were led offensively by Blake Bergeron who hit two homers in the game. It was Bergeron’s eighth of the year, which leads the team in that catetgory. Paul Gonzalez earned the win to stay perfect at 4-0 on the season. Gonzalez lasted seven innings, striking out five, walking just one and allowing just two hits. In the three game sweep, Liberal held the Broncos to just one run and nine hits in 23 innings. El Dorado drops to 22-20 overall and 10-16 in the Jayhawk League. The Bee Jays improve to 30-12 overall, and 21-11 in the league. Liberal will conclude their regular season at Hays on Tuesday and at Dodge City on Thursday. The games will air on 1270 AM and right here on ksbnews.net. 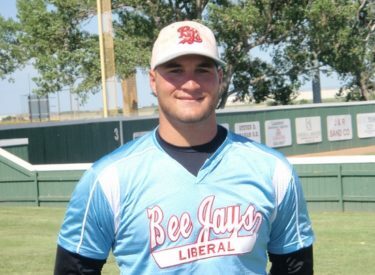 Liberal General Manager Bob Carlile has also learned that the Bee Jays will likely open up NBC World Series play on Sunday night in the feature game against the Austin Gold Sox.